Employees of Goodyear helping to fit kids with bike helmets as part of the Safe Mobility Project. 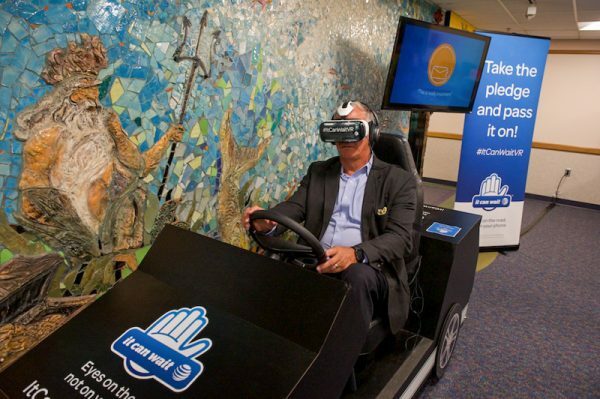 Preventing harm to our patients is one of the tenets of Akron Children Hospital’s mission. For Heather Trnka it’s part of her job description. As the injury prevention coalition coordinator for the hospital, her main role is preventing unintentional injuries in kids. From coordinating community safety fairs to teaching families how to properly install car seats, Heather is constantly on the go. Among the nearly 50 community events Heather has attended this year was the Touch-A-Truck event at the Reach Opportunity Center at Summit Lake. Hosted by the Akron Metropolitan Housing Authority, the event gives kids of all ages a chance to climb into fire engines, police cars, ambulances and more. Heather and her co-workers gave away water bottles, bubbles and gently used books through the hospital’s Reach Out and Read program. 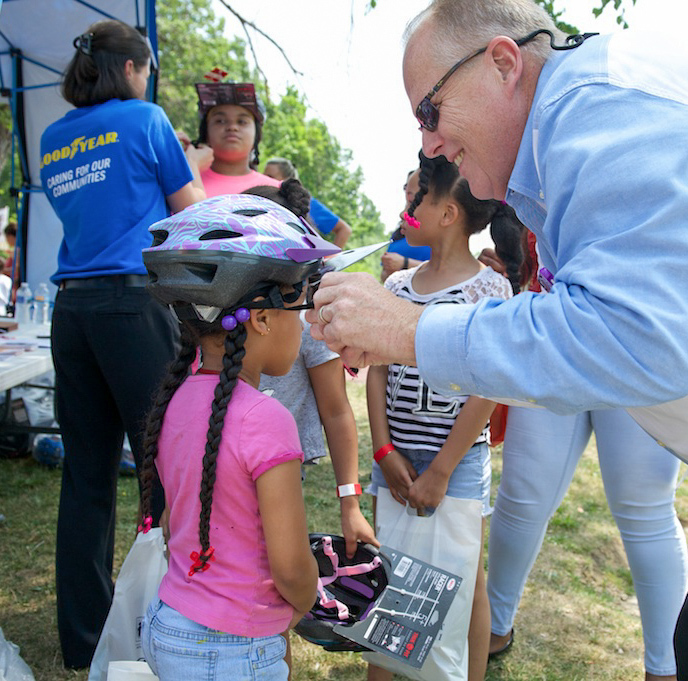 Working in cooperation with Goodyear, a partner with the hospital in the Safe Mobility Project, they also fit kids for bike helmets. The Safe Mobility Project, a 3-year grant-funded initiative from Goodyear, enables the hospital and its community partners, like AMHA, to expand child safety programs that aim to prevent injuries. Heather showing Bali how to secure Aaron. Other areas the grant focuses on include pedestrian safety, like walking to school programs and teen driver education. On this brisk fall day Heather and her team are set up in front of the Locust building on the hospital’s Akron campus doing car seat education and installations for Nepalese refugees who have settled in the North Hill section of Akron. 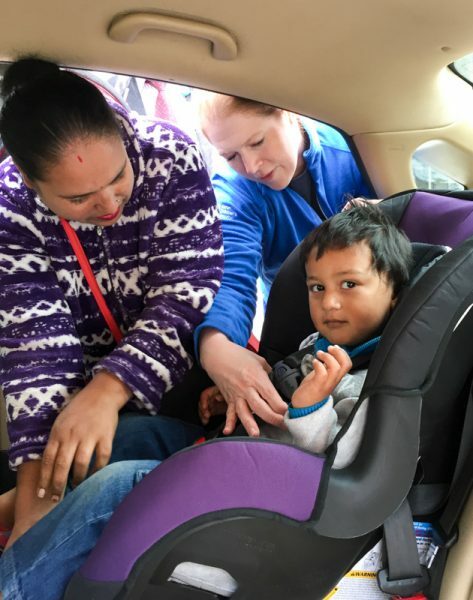 Twenty-two families, who were identified by community health worker Singh Rai (who also serves as a hospital interpreter), have shown up to receive car seats and learn about America’s traffic and mobility laws, which are vastly different from their own. The refugee populations are at higher risk for several reasons. Oftentimes, the laws about car seats, seat belts and how many passengers can be in a car are different from their native countries. Adult siblings Lok and Bali currently share a car and came to get seats fitted for their children. Bali’s 3-year-old son Aaron sits quietly as Heather adjusts the car seat straps over his shoulders. She teaches Bali how to properly install the seat, then asks her to do it herself. “Since this is a shared car, this seat will be coming in and out on a regular basis, so mom needs to know how to safely install it,” Heather explains. 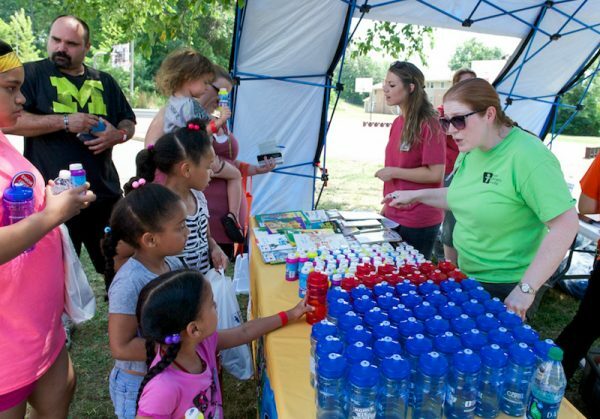 Heather spends about 40 percent of her time out of the office doing outreach and community events and the other 60 percent working on injury prevention programming – like bike helmet use and hydration and water safety programs, which are popular during the hot summer months. Other topics she covers include home and fire safety, safe sleep, sports and recreation injury prevention, and teen driving. The mom of 3 cites making a difference in keeping kids safe as what keeps her inspired on a daily basis. On Mondays, Wednesdays and Fridays, the injury prevention team is available from 9 a.m.- 3 p.m. for one-on-one car seat appointments for income-eligible families. They see an average of 15 to 20 families a week. One of Heather’s favorite events is the baby shower her department throws every year for high-risk moms. If you’d like to learn more about how you can make a difference for children and families, visit our job board.